Your students will ask for more practice of addition and subtraction facts with this pack! 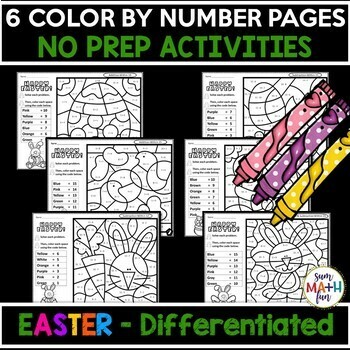 This Color by Number Easter packet is a way for students to practice and review addition and subtraction facts while being completely focused and having fun! And, they are differentiated! The targeted strategies for each page are Make Ten (Fast Tens) and Turn Around Facts (Flip Flop Facts). 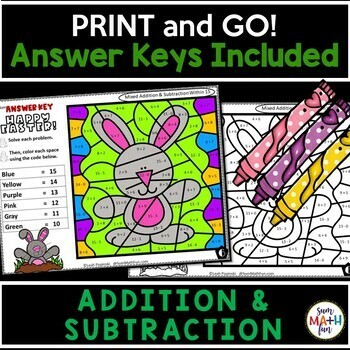 ⭐ These color by number printables were designed to give your students a fun math activity that reviews important math skills and to give you an easy way to engage your students with NO PREP. The repetition of finding the answers in an enjoyable way with the immediate feedback of seeing a correct picture will help your students commit their facts to memory for immediate recall. While your students will love coloring the Saint Patrick's Day pictures, they will be practicing and reviewing addition and subtraction facts! 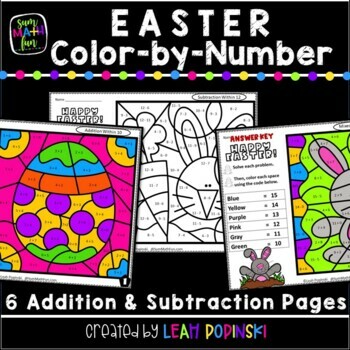 There are 6 color by number worksheets in this packet that will keep your students engaged and challenged. There are two pages for addition practice, two for subtraction, and two pages that have mixed addition and subtraction facts. ❤️ No Prep! Just Print and Use! ✍ I also appreciate your feedback, so please take a moment to rate my resource.